Bangalore: After a year that saw borrowing and inputs costs soar, crimping profit margins, property developers may have little choice but to put the brakes on expansion and try hard to push sales of existing projects in 2012 to generate cashflows as sales slow and inventories pile up. 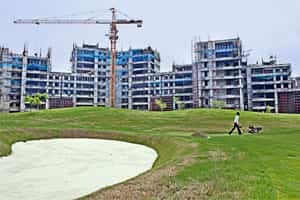 In the coming year, the realty market will likely see a consolidation of developer portfolios, with firms opting to dispose long-term assets and land to focus on what can be delivered in the short-term to generate cashflows, said Sanjay Dutt, chief executive, business, Jones Lang La Salle, a property advisory. A consolidation will likely tame the overheated industry by slowing unwarranted construction and weeding out firms that have only added to the competition. Real estate firms such as Bangalore’s Salarpuria Sattva Group and Ajmera Realty and Infrastructure Ltd as well as private equity investors are already scouting for buying opportunities in unfinished projects that need a bailout. “Developers will put forward their last-resort plan of action in the coming year," Dutt said. “That includes measures such as selling cheap, offering more flexible terms to private equity firms and NBFCs (non-banking financial companies) for raising debt, and also to consumers for making payments. Dutt also predicted “a lot of trading between developers of so-called distressed asset deals". In 2012, analysts foresee a 10-15% correction in prices in projects launched this year, and the overall anxiety of a slowdown in construction activity and project execution to continue. Developers continue to be under pressure with construction costs rising by 40% and labour costs rising by 60% over the past year and a half, said Lalit Kumar Jain, chairman and managing director of Kumar Urban Development Ltd.
“Hopefully, post June, the situation should improve because in cities such as Mumbai, buyers can hold on as long as 12-14 months," said Jain, also the national president of the Confederation of Real Estate Developers’ Association of India (Credai). Sales in Mumbai dropped by 20% in November from a year earlier and by 12% from the preceding month, according to a December report by brokerage Prabhudas Lilladher Pvt. Ltd. Yet, prices have steadily increased in Mumbai and NCR, the top markets. In the past year, Gurgaon saw the maximum price appreciation, followed by Mumbai and Pune, said analysts. Another aspect that has industry watchers worried going into the next year is the debt pile-up in the sector. Most developers over the past year have been trying to bring down their debt-equity ratios. India’s largest real estate firm DLF Ltd has a debt of ₹ 22,519 crore and is trying to sell assets across cities. DLF didn’t respond to a query on its strategy for 2012. Mumbai-based Housing Development Infrastructure Ltd (HDIL), which has a debt of ₹ 5,800 crore, too is trying to keep its debt under control and repay on schedule. “The focus would be on execution. One would consolidate and not be leveraged, and expansion plans can wait till 2013," said Hari Pandey, vice-president of finance at HDIL. Amit Goenka, national director, capital transactions, Knight Frank India, a property advisory, said “repayments may be an issue for highly leveraged players." The other worry is the ability to raise capital. The Reserve Bank of India has warned banks to be cautious about the sector, though according to a December report by IDFC Securities Ltd, lending by banks and NBFCs to developers between October 2010 and September grew 14% to ₹ 1.6 trillion. Developers that weren’t able to tap banks and NBFCs turned to PE funds and private lenders. This year, PE funds have invested $1.08 billion across 30 transactions in both projects and companies, according to VCCEdge, which tracks investments. In 2010, PE funds invested $1.1 billion in 35 deals. S. Sriniwasan, chief executive, Kotak Realty Fund, said now is a good time to take equity in real estate companies. “As a long-term player, if we get assets in a profit-sharing basis with the developer, we would put in equity instead of just lending," he said. The year 2010-11 saw the emergence of debt-structured deals, where returns are guaranteed and adequate protection is built in against risks. Jones Lang La Salle said in its India Capital Markets report that realty fund sizes will be smaller in 2012 so the investment cycles end quickly, and that there will be more niche funds with focused investment strategies.